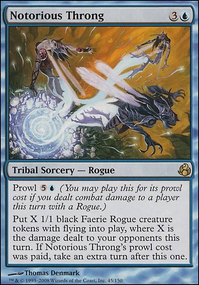 A question about Prowl mechanic. Whenever a Rogue you control attacks and isn't blocked, it gets +2/+1 until end of turn. I really don't think you need 4 Tetsuko Umezawa, Fugitive . Her only purpose in the deck seems to be that she helps Stinkdrinker Bandit be unblockable and that she is a rogue. Which, admittedly, is good in this deck. 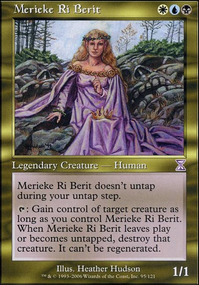 But fact is that she is a legendary creature, and you can only have 1 of those at a time. Each Tetsuko you draw after the first is a dead draw. Surely you can find another rogue that can replace 2 copies of Tetsuko? ninja988 - Thanks for the suggestions!! Lemme go through them here. Swapping card count for Stinkdrinker Bandit and Inkfathom Witch - There are two reasons there are more of Inkfathom Witch . For one, her ability let’s me access a higher bonus more quickly, rather than perhaps getting multiple Stinkdrinker Bandit ’s. Secondly, she actually has a conditional unblockable keyword, Fear. That makes her able to join the attack in most situations without external help like Stinkdrinker Bandit would need. However, you are right, Stinkdrinker Bandit ’s stacking potential isn’t really being utilized. So I compromised and made them both 3x. Oona's Blackguard - I’ll think about it. While she has the potential to do more discard than Mental Vapors , she’s also a LOT more easily removed. Sygg, River Cutthroat - I did consider him before, some other people have also recommended him. I feel, however, that Curious Obsession gives me more draw, and also serves as a buff. It also, again, is a lot harder to removed than Sygg, River Cutthroat . So I’m gonna keep what I got for this one. 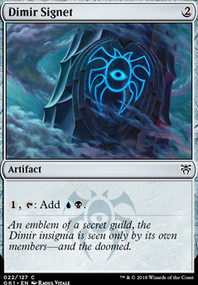 Oona's Blackguard for the Opness that is this card? Sygg, River Cutthroat for card draw? also makes sense as to why (a bit? card still seems op) only 2 Stinkdrinker Bandit , cuz only unblockable if you got Tetsuko Umezawa, Fugitive out. maybe 4 Stinkdrinker Bandit and 2 Inkfathom Witch ? Stinkdrinker will always be 2 mana, so it's not like that will ever be an issue. Plus the buffs stack if i am not mistaken :O the mana color might be the reason, but I see no reason to not run 4 of the Bandit. You need more one-drops. 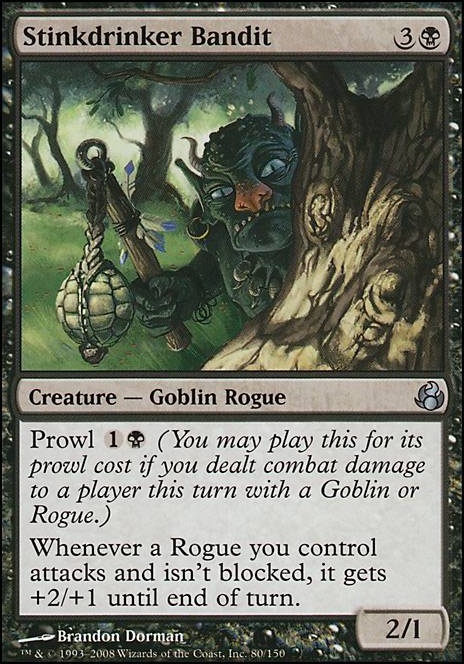 All you have right now is Faerie Miscreant, and Hidden Strings, Morsel Theft, Noggin Whack, and Stinkdrinker Bandit all get better when they can be consistently played on turn 2 (Stinkdrinker and Noggin Whack in particular). Without a solid one-drop suite most of the time you'll only be playing those cards on turn 3, which is too slow against many decks. I recommend you play at least 10 one-drops, more if possible. 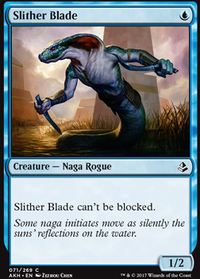 Slither Blade is the best one available, Triton Shorestalker is the worse version of it and Vampire Cutthroat can give some life gain. 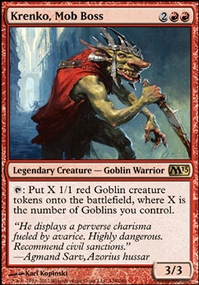 Also, fill out the rest of the playset of Stinkdrinker Bandit; it's your best card. 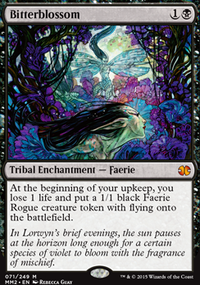 I'd drop a Oona's Prowler, Latchkey Faerie, or a Tetsuko for the last copy. Ouroboros_47 I like Stinkdrinker Bandit, but I’m not sure what I could take out to for him. Any suggestions there? What about Stinkdrinker Bandit and Vampire Cutthroat?